I just finished watching a double feature of Miyazaki films, Tales from Earthsea and Nausicaa of the Valley of the Wind . I didn't say Studio Ghibli double feature because technically Nausicaa of the Valley of the Wind was created before Studio Ghibli was founded, and I didn't say Hayao Miyazaki because Tales from Earthsea was directed by Hayao's son, Goro Miyazaki. Both films have a similar theme of balance with nature (like many Studio Ghibli films), though told in very different stories. 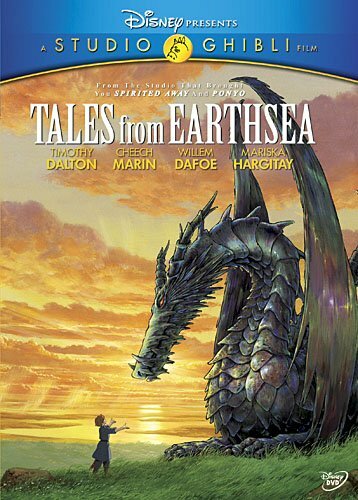 Tales from Earthsea is the most recent Studio Ghibli film to be localized and released in the United States by Disney, and as with all their previous Studio Ghibli localizations, they did a fantastic job. This story starts at sea, where a ship is caught in a storm and the captain of the ship tells some dude called a weather-worker to calm the waves, but the weather-work says that he can't remember the true names of the wind or of the waves. Um...okay. I didn't really understand that, but after seeing the movie all the way through I now understand that he is some kind of wizard and I guess they can control something by knowing its true name. Or something like that. I was never totally clear on this. Anyway, then a couple dragons are seen in the sky, fighting, which the weather-worker says is impossible. Next we move to the interior of a castle where a bunch of people are convened to discuss the state of the kingdom, which is not good. A whole bunch of sheep died, cattle have been infected, an infant has a fever, you know, the usual. Weather-workers were sent to cast spells to stop a drought, but that worked just about as well as calming the waves. So apparently magic isn't working so well anymore. It's like the world is getting out of balance or something. Now here's where it gets a little weird... after the meeting the king ends up walking alone in a hallways lined with statues when all of a sudden a young lad darts out and stabs the king with a knife and steals his sword. With the kings dying breath we learn that it was his son, Arren. The reason Arren kills his pop is unclear, and remains completely baffling until almost the end of the movie, at which point it goes from baffling to slightly confusing. Anyway, next thing we know we are watching some dude on a small boat row up onto a beach containg a bunch of old, dilapidated buildings. He walks off into the desert were we see a bunch of huge ships just sitting there in the sand, rotting away. Then the dude spies a wolf pack running off on the distance, and we find that they're actually chasing Arren, who I guess somehow transported to the desert. The dude, named Sparrowhawk, rescues Arren, who seemed just fine standing by ready to let the wolves eat him. Talk about a weird kid. From here, the two journey together, though their destination is unclear. When Arren asks, even Sparrowhawk says that they're just headed to the next town, but after that he does not know where the road. We're about fifteen minutes in at this point, and I'm thinking the animation sure looks beautiful, but where's the story? Where's the emotional connection with the characters? We're fifteen minutes in and we don't really have anything to show for it except that we're told there is something generally bad happening in the world and there's this weird kid who killed his dad because he wanted a sword or because he wanted to wander the desert or...? The movie is like an hour an fifty minutes long... and it seems like for no good reason. It does start picking up a bit from here, but even then the story still seems to lack direction. I won't say it's a bad movie, because it's not, just I expected more from a Studio Ghibli film. All the ones I've seen always got me to truly feel for their characters, and I've seen most, if not all of them, so from that standpoint this was a bit of a letdown. It takes place in a world of dragons and magic, though you rarely see either, and there are a lot of plot points that don't seem to go anywhere or make any sense, at least to me. Could be I'm just missing it, but if I miss that much then I think there's somethign off. To me, the best scenes in the movie are when Shadowhawk and Arren are working on the small farm, showing us that they're real people, and not just mysterious figures. The art was well done as well, but by far the best shot is of Hortown, the big city the two travel to. The overview shot where they're on the hill looking down on it is remarkable. Most Studio Ghibli films I wouldn't hesitate to recommend, but this one I'd have to say just rent it. There are two extra features on the DVD, a making-of featurette and something called Enter the Lands. The making-of is short, like four minutes, and tell more about how it came to be made than how it was actually made. The Enter the Lands feature is a bit unique, as it shows a map that's like Studio Ghibli productions were places on the map, so you select a place and it zooms in and shows you a preview of that movie. Then you're on a screen showing a still shot representing the film, and you can select different people and it will show a video clip with a voiceover telling about that character, and there are multiple pages so you can learn about various characters. It's kinda neat, but it's also disappointing that you can't click on everything on the map. Like I couldn't click on Princess Mononoke or My Neighbors the Yamadas.